[Guide] How To Clean A French Press The Easy Way? Cleaning a French press can be one of the most loved items to have in your home. If you love great coffee then it can be a great addition that can give you rich tasting coffee which can be a perfect way to start your morning or to give yourself a great drink throughout the day. There is one big negative, however, and everyone who has owned a French press knows it, and that is how hard they can be to clean. They are notorious for their cleaning difficulty, but there are ways that can make it so much easier. What Is The French Press? The French press is a way of brewing coffee which has developed over the course of many different designs over the last 150 years. The way it works is by placing ground coffee into an empty pot and adding hot water to it. A plunger is then pressed to then separate the grind from the water to leave you with a smooth coffee. The coffee steeps before the filter is pushed and when it is, the oils and fine particles pass through which means that the coffee is much richer than can be found with other devices. It was in 1852 that the first basic design of the French press came to life, which was created by two Frenchmen, but the press that you know today didn’t come from France. That first device didn’t create a seal, and the first patent of an improved device was made by two Italians in 1929. A further development was made by a man called Faliero Bondanini in 1958 which is like the one that we know today. Bondanini was Swiss but it was the French name that stuck in people’s mind. 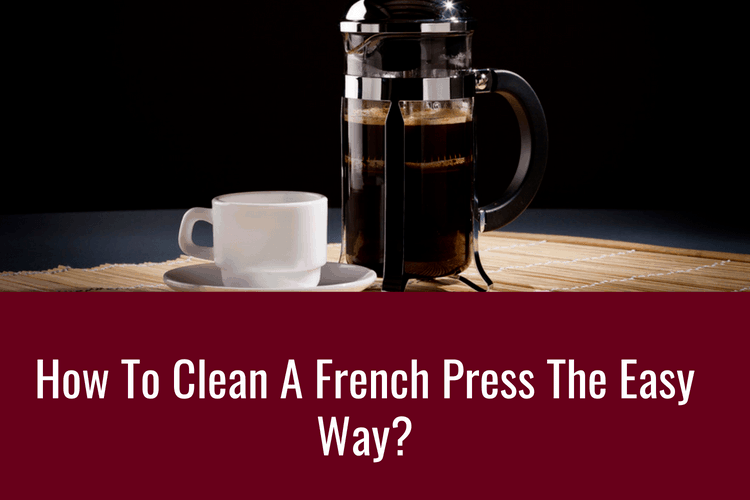 Why Is A French Press Hard To Clean? While a French press does produce a great tasting coffee, it comes at a price as they are difficult to clean and need constant cleaning. The reason that they do need that much cleaning is that having used coffee grind on the carafe and the plunger can make your coffee taste stale and bitter. So if you don’t clean it, then there is no point trying to make coffee in it. Due to the oils in the coffee, there will be residue left all around the carafe so all of it will need to be cleaned. Most importantly though, coffee grounds will sit at the bottom of the French press and need to be removed. Removing this grind isn’t easy and often takes a lot of hard work. You also need to make sure that the grind isn’t poured down the sink as this can clog it up over time. If the carafe can be difficult to clean, then the plunger can be even worse as there are plenty of spots for the used coffee grind to cling to. If you want to clean your French press properly, then you will need to disassemble it and clean its various parts separately. This can make cleaning your French press even more tedious and add extra time to each clean. Even though this is advised, you can afford to skip this step for a few times before you give it a proper clean. For these reasons, sometimes people can leave their press sitting on the side for too long as they don’t want the hassle, but if you can learn to clean it properly, then it makes the whole process a lot easier. How Do You Clean A French Press? If you own French press then you simply have to know the best way to clean it as it’ll make you want to use your press even more and therefore have that great tasting coffee more often. The first thing that you need to do is to fill the French press with water. This will help loosen up all of the grounds that are in the coffee. Once you have loosened them, then you want to pour that water into a sieve which will hold all of that grind. At this point, you may want to use a wooden spatula to scoop any stubborn grounds out. Why use a sieve? It is not advisable to dump grounds down the sink as this will block it over time. Next, you’ll want to fill the french press with water once again, but this time with warm and soapy water. The next step is to push and pull the plunger up and down the carafe in order to remove any grind that is sitting on there. You’ll want to do this a few times so that you’re getting the carafe to do most of the work for you. An additional but optional step is disassemble the parts and clean them separately. It is recommended to do it from time to time to avoid any weird taste from your french press coffee. For that deep clean, you can mix baking soda with water and scrub it into the plunger for a perfect clean. If there is hard water build up in the carafe, then a mix of vinegar and water would help remove this. Using these tips will give the quickest and easiest way to clean your French press. While it still takes effort, it is a lot easier than other methods and will have you reaching for that French press a lot more often than you usually would. If you do have to manually take out the grind, then it’s important to do it with something soft like a spatula. If you use a metal spoon, for example, this could break or scratch the glass. While it can be tempting to use your French press more than once without cleaning, this won’t produce great results at all so make sure you clean it each time, even if it’s not a deep clean. Most French presses are dishwasher safe and this can be a quick option for an easy life. Even still though, you will have to remove the grind before it does into the dishwasher and the plunger still might need a deep clean. As with any glass that has such a focus on taste, it would be best to let it air dry so that you’re not adding any unwanted residue to the glass. Towel drying the press though would be fine as long as the towel is already clean and dry before you use it. The press can be stored anywhere, but consideration needs to be given to how long as it’s been stored as dust and other such things could affect the cleanliness that it was left it, so make sure it can play clean when not being used. It’s always a shame when someone buys a French press and then loses interest in it if they think that it is too much of a hassle to clean it. Sometimes people don’t clean it properly and forget just how good the coffee it can make can be. If you follow this simpler process through then it will be simple and quick and most importantly it will have you coming back time and time again to the great coffee that you want. Cleaning a French press shouldn’t have to be a chore, you just need to know how to do it properly so you’re always happy to spend the time making your favourite drink.